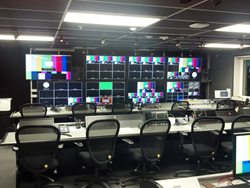 TV studios need production space quickly and for a temporary period. The entertainment industry is a unique application for our product, but the need to have the building available on demand, for a specified duration, makes modular buildings a perfect alternative for their production and support facilities. In the hi-tech world of modern TV production there are three key elements that must be met. Content is obviously important, but to deliver the product the facilities and equipment must be delivered on time, on budget, and meet the technical requirements of the production company. All are critical elements with no room for error. “The Show Must Go On”, is a long lasting and very true adage. TV schedules are planned months in advance and the time between commercials and shows are instantaneous. So when a show is to go live, everything must be in its place and ready to go. Delays are simply not in the vocabulary. Along with schedule planning, there is the ever important financial planning. Television broadcasting is not cheap, so budgets are finely tuned and monitored to insure financial success. All elements of the show must meet the programming requirements, and within budgeted cost. While production companies are betting millions of dollars on a shows success, you can be sure they will not be around long if cost is not controlled. That applies to start-up cost, and turning off the cost when the particular season ends. The third, element is quality. American TV is the highest quality media broadcast in the world. All equipment involved must meet this standard. When it comes to the facilities to house the technical side of the production, studios and production companies have found an unexpected, but perfect option with the use of modular buildings. Design Space Modular Buildings is one such company that provides modular buildings and mobile offices to the entertainment industry. As Paul McShane the President of Design Space explains, “The entertainment industry is a unique application for our product, but the need to have the building available on demand, for a specified duration, makes modular buildings a perfect alternative for their production and support facilities.” Mr. McShane continues, “Giving the personal attention and technical expertise these projects require is the priority at Design Space.” In fact over recent years Design Space has provided the industry everything from dressing rooms, master control rooms, sound booths, audio control rooms, video edit rooms, and more. They have provided these facilities for sporting events, daytime talk shows, reality TV, and late night television. If you would like more information on the aspect of television production, or modular buildings and mobile offices in general, feel free to contact Design Space directly at 866-889-7777 or through their website at http://www.DesignSpaceModular.com.